A brief recapitulation of the previous part on diagnosis and detection  will provide a scaffold for further discussion. Lack of definite delineation in the physiology-pathology continuum of the caries process poses challenges in the diagnosis and detection of dental caries. Lesion detection primarily focuses on the detection of very early demineralizations that are not easily discernible. Refined visual -tactile criteria in conjunction with sophisticated gadgets are used to reliably detect the earliest signs of initial demineralization. Once detected, the lesions are further assessed for extent and activity. The 'risk model' aspect of the caries risk assessment not only helps to categorize the risk status of patient as high/ low/ moderate, but also helps to diagnose the caries disease. It aids in identifying the dominant biological determinant that is responsible for the disease. The prognosis of the disease and the rate of progression of the lesion are assessed by the 'predictor model' facet of caries risk assessment. The crux of the exhaustive process of the diagnosis of any disease is its control and cure. The treatment decisions for any disease usually focus on the management of the signs, the symptoms and the elimination of the cause/s of the disease. Additional decisions are also taken to prevent the recurrence of the disease. Most often, elimination of the causes alone may result in the inadvertent reversal of the disease signals. But for certain diseases, the treatment decisions bifurcate to manage the manifestations or the ravages of the disease separately. Dental caries is such a disease, where the management is dichotomous, targeting the disease and the lesion. Caries disease is managed by background level treatments directed against the dominant causative factor/s. These treatments are mostly non-invasive in nature. Carious lesion management addresses the demineralization and remineralization cycle at the tooth mineral level, by using both non-invasive and invasive treatment strategies. Treatment decision was deceptively simple when dental caries was equated to just a cavity in the tooth and treatment was equated to just filling the cavity. The intense focus was on the 'art' of creating a good restoration. Material science advancement and technical revolution in high speed cutting gadgets, though improved the quality of the restorative treatment, ironically sidelined the disease nature of dental caries. For centuries, this mechanical solution for a biological problem prevailed. It is not that the profession was ignorant of the biological nature of dental caries. GV Black in 1908 in his text book Operative Dentistry stated that this attitude is "….an anomaly in science that should not continue. It has the apparent tendency to make dentists mechanics only." In 1967 Massler stated that "…disturbing….to witness the overly focused attention of some dentists upon the operative and restorative phases of dentistry, the drilling and filling of teeth, to the neglect of the disease process which causes the lesion (cariology) and the pre operative treatment of the wounded tooth-bone." The concept of prevention of dental caries is not new either. Since McKay stumbled upon the 'Colorado brown stain', fluorides' anti-cariogenicity has been well studied and proved. Introduction of water fluoridation kick started a plethora of preventive concepts. But it is disturbing to note that prevention at the individual patient/ tooth/ surface level still receives less attention in practice, compared to population/ community level. Even if preventive managements are included in the individual treatment plan, they generally are added as supplementary to the restorative treatment, not as the primary treatments. Young et al. criticizes that the term prevention has become a term that has been "blanched and simplified into to only mean 'brush and floss' and 'don't eat sugar'". Kidd et al. astutely observed that the oral prophylaxis or dietary counseling or oral hygienic instructions are given by the dental assistants, not by the dentist, thus making the patients think that they are unimportant. Low patient compliance is the direct result of this wrong message. Perhaps, prescriptions and advices fade out in the face of the action packed filling procedure! Out of innumerable reasons that can be incriminated for such unjustifiable protocols, the prime accused is the educational system. A dental graduate is still trained to 'do' the 'things right' (e.g. getting the cavity and restoration perfectly) and not trained to 'think' the 'right thing' (e.g. is a restoration really needed). Pass or fail is still determined by the quality of his/ her restoration. Despite a common objective of treating caries, both restorative dentistry and preventive dentistry do not converge in academics as well as in practice. They always remain as parallel entities failing to impart a wholesome knowledge for a comprehensive treatment plan. However, with the current changeover in all dimensions of dental caries, productive and desirable changes are evident in the management decisions. First, there is now an intense focus on the preventive strategies and minimal/ non-invasive management of the incipient lesions. Essentially, all the treatment strategies under the umbrella of prevention either alter or modify the causative factors in the dental caries etiology, such as diet factor/ host factor/ salivary factor and the microbial factor. Thus, their role in caries disease management is very crucial. These strategies are categorized as primary, secondary and tertiary. Primary prevention prevents the onset of new lesions in the healthy tooth and secondary prevention controls or arrests the progress of already existing incipient demineralization. Thus, it can be understood that preventive treatment not only just prevents the disease, but also treats the lesions. To underscore the importance of the preventive protocols as disease management solutions and also to emphasize that they are as equally important as the restorative component of the treatment decision, a change in the nomenclature has been suggested. Prevention is now preferred to be called as non-operative treatment, thus giving it an equal status as operative treatment or restorations. Is there a need to intervene for this lesion? If yes, does it require a non-operative treatment or an operative treatment? If preventive treatment, what is the regime? If restorative treatment, how minimally can it be done? Does the patient fall under high/ low/moderate risk status? Which is the dominant causal factor/s? 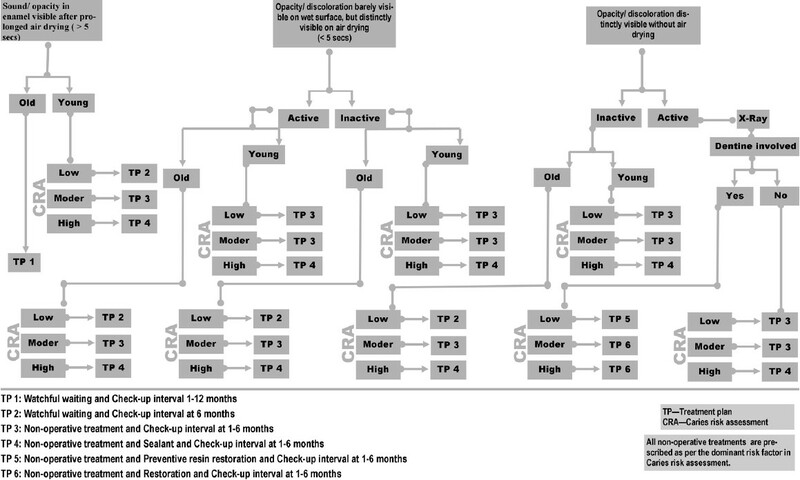 [Figure 1] depicts a classical treatment decision tree for a pit and fissure lesion. On close study, three factors emerge that critically influence the treatment plan, especially for non-cavitated lesion. They are lesion activity, age, and caries risk status. Color and texture of the lesion can differentiate an active lesion from an inactive lesion. Actively progressing lesions definitely have to be interrupted in their dynamics, whereas the inactive lesions, even if they are in later stages of demineralization need not be disturbed. They are kept under watchful surveillance. In addition, treatment decision for a similar lesion can vary between a young tooth and an old tooth. In a susceptible age group, there is more likely a chance for a seemingly inactive non-cavitated lesion to transform into an active lesion. Therefore, a more intense therapy is advocated for young tooth compared to old tooth. The most important factor that can modify the clinical judgment in management is the caries risk status of the patient. Caries risk assessment evaluates the risk status of the patient and also identifies the dominant disease causing factor/s. Once they are identified, specific tailor-made treatment is planned targeting them. In the absence of this identification, the non-operative prescriptions tend to be either insufficient or unnecessary. Assessment of the risk status also enables the prognostication of the activity of lesion. For example, an inactive lesion in a high risk status shall receive an intense treatment than in a low risk status. Exhaustive guidelines have been laid down for both non-operative and operative treatment strategies based on caries risk assessment. One such assessment is the CAMBRA (Caries management by risk assessment) guideline. This lays out a complete guideline with regard to when to take a bite-wing radiograph, when to recall the patient, when to do the caries risk assessment, whether to prescribe minerals / antimicrobials, how much to prescribe and for how long. This exhaustive guideline based on evidence is given for all the caries risk status. It also includes the indication for pit and fissure sealant procedure. ICDAS (International caries detection and assessment system) guidelines are also available. 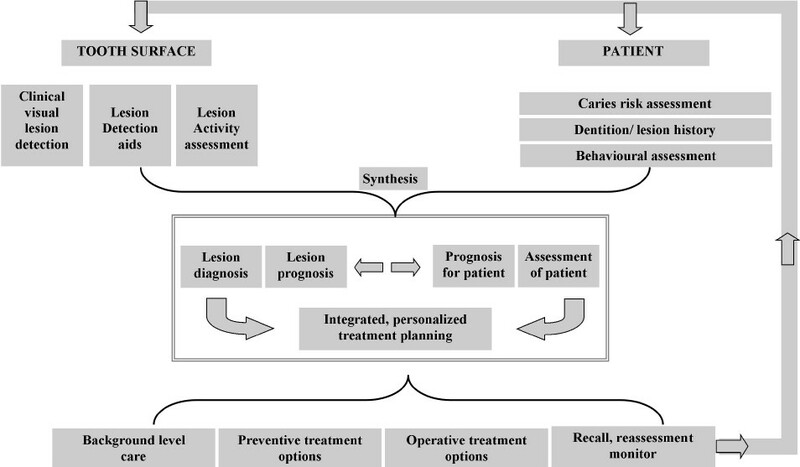 [Figure 2] depicts the newer philosophy proposed by ICDAS for caries management that takes into consideration lesion status and the risk status. It should be understood from these guidelines, that, be it invasive or non-invasive treatment or be it cavitated or non-cavitated lesion, the intensity/ severity/ frequency of all types of treatments vary with caries activity, age, risk status. The decisions to 'wait and watch' and the period of follow-ups also form important part of treatment decision. 'Watchful wait' is a prudent non-operative strategy, and should not end up as supervised neglect. The frequency of recall visits and the actions to be taken in each recall visit will again depend on the risk status of the patient and activity status of the lesion. Non-operative treatments act at various planes of the dental caries disease dynamics. It should be borne in mind that no single modality can effectively control the disease, as the disease process is a complex interaction of the multiple causal determinants. Various treatment modalities have to act in concert to combat the disease comprehensively. Discovery of fluorides' anti-caries effect borders serendipity. Lack of caries affliction in fluorosed teeth aroused the curiosity of the profession, precipitating a series of scientific explorations into this chemical, for its anti-caries effect. Many years of evaluation has culminated in very strong evidence on the remineralizing capacity and also in its capacity to increase the tooth's resistance to demineralization. Formation of fluorapatite crystals that are more acid resistant than hydroxyapatite crystals has been attributed as the primary mechanism of action. However, prevalence of dental caries even after a widespread systemic fluoridation raised queries on the pre-eruptive effect of fluoride on enamel. Owing to this lacuna, post-eruptive effect of fluoride became the topic of interest. Presence of free fluoride ions in the biofilm and the oral fluid is now considered to be more important than the concentration of bound fluoride in the enamel. It has been found that, under an acid attack, it is the free fluoride ions, along with the calcium ions, that influence the remineralization process. Thus emerged the wide spread use of topical fluorides, where free fluoride ions were made available at the tooth's vicinity in high concentration. The effective use of minerals in the fortification of the tooth against acid attack shall go futile, unless the micro organisms that produce the acid are dealt with. Furthermore, a thick biofilm on the tooth surface prevents active penetration of fluorides into the enamel. Elimination of the entire biofilm from the tooth surface, either mechanically or chemically, is not only impossible but also imprudent. Plaque biofilm is an inherent part of the host conferring a certain degree of defense to the tooth from foreign invasion. However, mechanical means such as brushing and flossing have not only been effective in reducing the plaque mass, but the efficacy of fluoride is also enhanced in reduced plaque thickness. As any vaccine should be instituted before introduction of the infectious agent into the system, caries vaccine should also be administered in the pediatric stage. A period of 'window of infectivity' has been observed in the bacterial colonization of infants' oral cavity. From the middle of the second year to the end of the third year is the period when colonization occurs and the source is most likely the feeding mother. Thus, it is logical to administer the vaccine before this period. Various pre clinical studies have established the effect of these vaccines, but clinical trials in humans are still pending verdict. Although active immunization can confer long-term immunity, it is not without adverse effects. The probability of cross-reactivity to the heart tissue has not been ruled out yet. The risk is more compared to the benefits; especially for a non-life threatening disease that can be effectively controlled by other safe preventive measures. Doubts linger about the comprehensive efficacy of a vaccine that targets only streptococcus mutans without taking into consideration the interaction or the role of other causal microbes, such as streptococcus sobrinus. Coupled with the cost in manufacturing and the complexity of clinical trials, the above mentioned reasons have been incriminated as reasons for the retarded growth of active vaccine. One-stop solution to combat a salivary problem is to increase the salivary flow. Increasing the flow, improves the buffering capacity as well as the cleansing action. Not much has changed in this realization from yester years. Topical/ local therapies and systemic therapies are continued to stimulate the salivary flow. Chewing gums are in the lime light now. Flavored chewing gums result in increased salivary flow through gustatory stimulation. Chewing gums containing no sugar/ sugar substitutes have been recommended for routine prescription. Xylitol containing chewing gums have received much attention in the recent past. Xylitol is sugar alcohol which has exhibited a bacteriostatic effect on the s. mutans. The cariogenic bacteria do not ferment these sugars to acid, so they are popular as non-acidogenic sugars. However, the caries-preventing effect of these chewing gums seems to be based on stimulation of saliva rather than the antibacterial effect. Minerals such as CPP-ACP and fluorides are also added to the xylitol containing gums to combine their beneficial effects. Dietary counselling is the only treatment modality available under this section. Counselling is the toughest part of the caries management as it requires complete frankness, co-operation and compliance from the patient's side. Dental caries is not considered as grave as diabetes mellitus, which is another diet-influenced disease; thus the above-mentioned commitment is not easily earned by a dental clinician. Drastically curtailing the sugar intake is not a prudent advice. Instead, caloric or non-caloric sugar substitutes should be suggested. Certain countries have 'tooth friendly' logo in the commercial products. Probably statutory warning like 'eating sweets is injurious to dental health' would improve the dental awareness among patients! Current literature does not have any evidence relating a systematic dietary counselling and reduction in caries incidence. Widening or beveling the entry of the fissure for better visualization, detection and management has been suggested for many years. Recent literatures call them as fissurotomy, or ultra conservative preparations. It is interesting to note that this is very similar to the old procedures that were called as prophylactic odontotomy and enameloplasty. The common objective among them is to widen/ make the fissure shallow and either to leave it self cleansable or to restore with adhesive resins. This technique is also called as caries biopsy  if it is mainly intended to detect the lesions at the depth of the fissure. Along side, the real need for such complete removal infected dentine is also being questioned. It is now suggested that it is not mandatory to remove all the infected dentin from the cavity in the best interest of safety of the pulp. Fissure sealant procedures over carious dentin, step-wise excavation method  where caries is intentionally left out in deep cavities, are some of the procedures that follow this style. This concept places unshakable faith in the ability of the restoration/ sealant to provide the 'perfect seal'. Achieving a marginal seal that totally deprives the leakage of nutrition to the left-over bacteria is aptly described as 'seal is the deal'. Objectives such as conservation of health, prevention/ eradication of the disease constantly drive the minimal intervention treatment philosophy of dental caries. Optimism surges every time a novel concept or method emerges. But in this evidence based era, to sustain as effective management tool, they have to undergo long-term randomized control clinical trials. Therefore, despite being effective, in the absence of such trials, they might be branded as having inconclusive or weak evidence. Lack of strong evidence, in turn, does not warrant their effective end-usage namely patient service. A vital question to be addressed at the end of this three part series is "Is clinical practice updated with these back-to-back changes in dental caries concepts?" Unfortunately, there exists a big gulf between research, education and practice in this regard. Research in cariology is sky-rocketing, bringing out the hidden facts of this age-old disease, but the education and clinical practice is adopting them in a snail pace. Education should empower the profession with latest developments in cariology and also inspire ways to practice them for the ultimate benefit of the patients. But conflicting objectives in education have detached 'theory' from 'practice'. By large, in clinical practice, dental caries is still being treated symptomatically, just like common cold. The comfort level that has been acquired by clinicians from long years of practicing 'restorative' dentistry is probably too 'comfortable', preventing them from addressing the new nuances of caries. Dental caries and common cold has one thing in common; not threatening to life. But unlike common cold that does not have a cure, dental caries has abundant option to be cured and eradicated. Not utilizing them to the best effect, is indeed unacceptable, because, after all, improving the quality of life is as grave a responsibility as saving the life itself. 1. Usha C, Sathyanarayanan R. Dental caries: A complete changeover (Part 2). J Conserv Dent 2009;12:87-100. 2. Black GV. Operative dentistrty. Pathology of the hard tissues of the teeth. Vol. 1. Chicago, II: Medico-Dental Publishing Co.; 1908. 3. Massler M. Pulpal reactions to dental caries. Int Dent J 1967;17:441-60. 4. Young DA, Featherstone JD, Roth JR. Curing the silent epidemic: Caries management in the 21st century and beyond. J Calif Dent Assoc 2007;35:681-5. 5. Kidd EA, Fejerskov O. The control of disease progression: Non-operative treatment. In: Fejerskov O, Kidd E, Nyvad B, Baelum V, editors. Dental caries: The disease and its clinical management. 2nd ed. San Francisco, US. Blackwell Munksgaard Ltd; 2008. p. 252-5. 6. Longbottom C, Ekstrand K, Zero D. Traditional preventive treatment options. Monogr Oral Sci 2009;21:149-55. 7. Kidd EA, van Amerongen JP, van Amerongen WE. The role of operative treatment in caries control. In: Fejerskov O, Kidd E, Nyvad B, Baelum V, editors. Dental caries: The disease and its clinical management. 2nd ed. San Francisco, US. Blackwell Munksgaard Ltd; 2008. p. 356-65. 8. van Amerongen JP, van Amerongen WE, Watson TF, Opdam NJ. In: Fejerskov O, Kidd E, Nyvad B, Baelum V, editors. Dental caries: The disease and its clinical management. 2nd ed. San Francisco, US. Blackwell Munksgaard Ltd; 2008. p. 386-425. 9. Pitts NB, Richards D; International Caries Detection and Assessment System Committee. Personalized treatment planning. Monogr Oral Sci 2009;21:128-43. 10. Ten Cate JM. Fluorides in caries prevention and control: Empiricism or science. Caries Res 2004;38:254-7. 11. Hellwig E, Lennon AM. Systemic versus topical fluoride. Caries Res 2004;38:258-62. 12. Marinho VC, Higgins JP, Logan S, Sheiham A. Fluoride gels for preventing dental caries in children and adolescents. Cochrane Database Syst Rev 2002;1:CD002280. 13. Marinho VC, Higgins JP, Logan S, Sheiham A. Fluoride mouthrinses for preventing dental caries in children and adolescents. Cochrane Database Syst Rev 2003;3:CD002284. 14. Marinho VC, Higgins JP, Sheiham A, Logan S. Fluoride toothpastes for preventing dental caries in children and adolescents. Cochrane Database Syst Rev 2003;1:CD002278. 15. Marinho VC, Higgins JP, Logan S, Sheiham A. Fluoride varnishes for preventing dental caries in children and adolescents. Cochrane Database Syst Rev 2002;1:CD002279. 16. Marinho VC, Higgins JP, Sheiham A, Logan S. One topical fluoride (toothpastes, or mouthrinses, or gels, or varnishes) versus another for preventing dental caries in children and adolescents. Cochrane Database Syst Rev 2004;1:CD002780. 17. Marinho VC, Higgins JP, Logan S, Sheiham A. Topical fluoride (toothpastes, mouthrinses, gels or varnishes) for preventing dental caries in children and adolescents. Cochrane Database Syst Rev 2003;4:CD002782. 18. SBU. Prevention of dental caries: A systematic review. Rep No 161. Swedish Council on Technology assessment in health care. 2002. p. 1-26. 19. Kidd EA, Joyston-Bechal S. Fluoride supplementation in dental practice. In: Kidd EA, Joyston-Bechal S, editors. Essentials of dental caries. 2nd ed. Oxford: Oxford University Press; 1997. p. 104-22. 20. American Dental Association Council on Scientific Affairs. Professionally applied topical fluoride: Evidence-based clinical recommendations. J Am Dent Assoc 2006;137:1151-9. 21. Wiegand A, Buchalla W, Attin T. Review on fluoride-releasing restorative materials-fluoride release and uptake characteristics, antibacterial activity and influence on caries formation. Dent Mater 2007;23:343-62. 22. Pessan JP, Al-Ibrahim NS, Buzalaf MA, Toumba KJ. Slow-release fluoride devices: a literature review. J Appl Oral Sci 2008;16:238-46. 23. Bonner BC, Clarkson JE, Dobbyn L, Khanna S. Slow-release fluoride devices for the control of dental decay. Cochrane Database Syst Rev 2006;18:CD005101. 24. Reynolds EC. Calcium phosphate-based remineralization systems: scientific evidence? Aust Dent J 2008;53:268-73. 25. Azarpazhooh A, Limeback H. Clinical efficacy of casein derivatives. a systematic review of the literature. J Am Dent Assoc 2008;139:915-24. 26. Vlacic J, Meyers IA, Kim J, Walsh LJ. Laser-activated fluoride treatment of enamel against an artificial caries challenge: comparison of five wavelengths. Aust Dent J 2007;52:101-5. 27. Beauchamp J, Caufield PW, Crall JJ, Donly K, Feigal R, Gooch B, et al. Evidence-based clinical recommendations for the use of pit and fissure sealants. A report of the American Dental Association Council on Scientific affairs. J Am Dent Assoc 2008;139:257-68. 28. Martignon S, Ekstrand KR, Ellwood R. Efficacy of sealing proximal early active lesions: An 18-month clinical study evaluated by conventional and subtraction radiography. Caries Res 2006;40:382-8. 29. Sceie AA, Petersen FC. Antimicrobials in caries control. In: Fejerskov O, Kidd E, Nyvad B, Baelum V, editors. Dental Caries -The disease and its clinical management. 2nd ed. UK: Blackwell Munksgaard Ltd; 2008. p. 266-76. 30. Twetman S. Antimicrobials in future caries control. Caries Res 2004;38:223-9. 31. Autio-Gold J. The role of chlorhexidine in caries prevention. Oper Dent 2008;33:710-6. 32. Anusavice KJ. Present and future approaches for the control of caries. J Dent Educ 2005;69:538-54. 33. Meurman JH, Stamatova I. Probiotics: contributions to oral health. Oral Dis 2007;13:443-51. 34. Smith DJ. Dental caries vaccines: prospects and concerns. Crit Rev Oral Biol Med 2002;13:335-49. 35. Bowen WH. Do we need to be concerned about dental caries in the coming millennium? Crit Rev Oral Biol Med 2002;13:126-31. 36. Russell MW, Childers NK, Michalek SM, Smith DJ, Taubman MA. A caries vaccine? The state of the science of immunization against dental caries. Caries Res 2004;38:230-5. 37. Krasse B, Emilson CG, Gahnberg L. An anticaries vaccine: report on the status of research. Caries Res 1987;21:255-76. 38. Russel RR. Might caries control involve immunization and gene therapy? In: Fejerskov O, Kidd E, Nyvad B, Baelum V, editors. Dental Caries -The disease and its clinical management. 2nd ed. UK: Blackwell Munksgaard Ltd; 2008. p. 280-6. 39. Abiko Y. Passive immunization against dental caries and periodontal disease: development of recombinant and human monoclonal antibody. Crit Rev Oral Biol Med 2000;11:140-58. 40. Fox PC. Salivary enhancement therapies. Caries Res 2004;38: 241-46. 41. van Loveren C. Sugar alcohols: what is the evidence for caries-preventive and caries-therapeutic effects? Caries Res 2004;38:286-93. 42. Kidd EA, Joyston-Bechal S. Diet and dental caries. In: Kidd EA, Joyston-Bechal S, editors. Essentials of Dental caries. 2nd ed. Oxford: Oxford University Press; 1997. p. 79-103. 43. Rickettes DN, Pitts NB. Novel operative treatment options. In: Pitts NB, editor. Detection, assessment, diagnosis and monitoring of caries. Vol. 21. Monogr Oral Sci, Basel, Krager; 2009. p. 174-87. 44. McComb D. Systematic review of conservative operative caries management strategies. J Dent Educ 2001;65:1154-61. 45. Kidd EA, Joyston-Bechal S, Beighton D. The use of caries detector dye during cavity preparation; a microbiological assessment. Br Dent J 1993;174:245-8. 46. Krause F, Braun A, Eberhard J, Jepsen S. Laser fluorescence measurements compared to electrical resistance of residual dentine in excavated cavities In vivo. Caries Res 2007;41:135-40.